Unruly scenes were witnessed today in the district court complex here after a senior advocate allegedly tried to attack an ‘ahlmad’ (clerk) and hurled insults at him. Two persons, including a child labourer, received electric shocks after they came in contact with the overhead high tension wire near Kochar Market here today. Goods worth lakhs were gutted in two fire incidents at different places in the city.Fire broke out at Kohli Textiles at New Madhopuri late last night and at the Fountain Chowk branch of the State Bank of India today morning. Two cops might land in trouble for concocting an escape story of a criminal. Police sources said the undertrial fled from custody while he was being taken for hearing to Jalandhar in connection with a criminal case today. Perhaps for the first time after the Tobacco Control Act, 2003, was given effect in the state last year, the district health authorities today challaned those found smoking and using other tobacco products at public places in the city and imposed penalty on the offenders. City residents danced to the tunes of Punjabi pop singer Shankar Sahawney during the “Sound for India” campaign launched by Panasonic at Westend Mall. The lobby of the mall was crowded with people who were shaking a leg with the pop singer. The government schoolteachers have disapproved the time and mode fixed for bringing into effect the rationalisation policy of the Panjab government. Trees are symbol of selfless and dedicated life. Besides providing oxygen, wood and clean environment, they motivate us to serve even the unknown. These views were expressed by Dr VK Taneja, Vice-Chancellor, Guru Angad Dev Veterinary and Animal Sciences University while launching a plantation drive by GADVASU Green Club.He appreciated the cause by students’ community. He said if youth would take responsibility only then we would be able to save our planet. Jasdeep Kaur Ratol of Phallewal village near here has brought laurels by securing a top position in MBA (tourism and hospitality) of Lovely Professional University, Phagwara. Zila Parishad chairman Manpreet Singh Ayali, who also heads the district health monitoring and planning committee, today inaugurated a "rural preventive healthcare mission" at SPS Apollo Hospitals here. The staff and students of Guru Nanak Model Senior Secondary School celebrated Teej on the school premises here today. Dressed in Punjabi attire, Poonam Dhillon looked as gorgeous as ever. Belonging to Chandigarh, she loves to be in Punjab. “I got excited the moment I entered Punjab and felt like coming back to my roots,” she smiled. 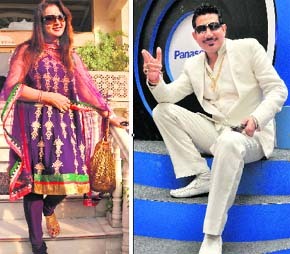 Poonam Dhillon, along with actor Aasif Sheikh, is in the city for “Pyar Mein Kabhi Kabhi” to be staged tomorrow. With no fresh case of gastroenteritis reported in the city during the past 24 hours and the number of patients admitted in Civil Hospital, private hospitals and nursing homes getting down to 45, health officials today claimed that the infection was on the wane. Farmers of Khanna, Samrala and Payal tehsils will stage a dharna near a site at Harbanspura where a pipeline is to be laid by GAIL India. Perturbed over the “callous” attitude of the Ludhiana Municipal Corporation officials towards the problems of general public, BJP leaders and councillors today lodged a complaint with MC Commissioner AK Sinha. The rural branch of Oriental Bank of Commerce (OBC) was yesterday inaugurated at Dewatwal village. H Rathnakara Hegde, executive director, Oriental Bank of Commerce, visited Ludhiana and inaugurated the rural branch at Dewatwal village. Four persons, including two travel agents, were booked today while they were trying to procure a passport on the basis of fake documents. SHO Wariam Singh said Balwinder Singh Bagga Patti of Kalsan village wanted to go Kuwait. He approached travel agents Johny and Bhatti through Malkait Singh Brar, a middle man, for getting a work permit and VISA for Kuwait. The deal was struck for `1.25 lakh. Kunwardeep Singh from Amritsar survived a scare against Patiala lad Anmoldeep Singh before romping home as champion in the junior section on the sixth day of the Punjab State Snooker Championship being held at Sutlej Club, here today. Top seed Kunwardeep overcame stiff challenge from his rival whom he drubbed with a narrow margin (4-3).